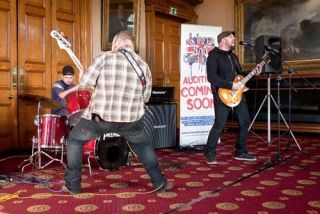 Live and Unsigned, the UK's biggest unsigned music competition for original artists, saw its first round of live auditions earlier this week at locations in Cardiff, Basildon and Dewsbury. Over 900 acts made it to the three audition sessions, all hoping to gain a place in the regional finals and, eventually, to compete in the grand final at London's IndigO2. The judges have even been posting feedback from some of the auditions online, check out what they thought of the entrants at Cardiff, Dewsbury and Basildon. That's Lockin from the Dewsbury auditions pictured above! In what has to be one of the best talent show prizes we've ever seen, the act crowed winner will be awarded a recording contract with Future Music Management, a publicity package worth £15,000 (including coverage in 'Kerrang! ', 'Q', 'NME', 'Mojo' and 'The Fly'), a further £15,000 towards a single release package (including studio time and promotion), a UK tour of up to 100 shows (with expenses up to £7,500) and the development of a clothing brand with Extreme State. Auditions will be taking place all over the UK through January and February and it's not too late to sign up! Just head to the Live and Unsigned website to register now.